astrotomato https://astrotomato.wordpress.com Author of the novels Sympathy for the Devil, Backpackers and the Planetfall series. Amateur photographer. Experienced environmentalist. Busy times! Life has been hectic since my last blog post in … September?! Blimey. Sympathy for the Devil is complete, formatted, reviewed by my brilliant beta readers, and is now out looking for representation. So far it’s been to 30 different literary agents, and I’ve received rejections from 11 of them. Eighteen never responded – I assume these are therefore rejections – and I am waiting to hear from one more agent. A lot of the responses from agents have been personal and very positive. There’s been a couple of ‘form rejections’ (those where it’s clearly a standard letter saying thanks-but-no-thanks). The personal responses were very heartening, essentially saying, “Yep, it’s strong enough, the writing is there, but it’s not right for our particular agency.” I love these responses. All of the submissions I’ve made so far are to agents who accept e-submissions. I haven’t sent Sympathy to any agency that demands a printed submission. I think it’s a waste of paper and money. The author has to pay for printing and postage, and the agency has to pay for disposal costs later (if the author hasn’t paid for a return SAE). It’s so outdated and wasteful as to be laughable. I imagine literary agencies with piles of paper, towers of mulched wood and ink surrounding poor graduates. When instead they could simply transfer a Word doc to a Kindle and read submissions anywhere. In September I also wrote a short story, Maisy & Jim. I sent it to a literary magazine, which duly rejected it. I will be keeping it on file for a later short story collection, I think. Currently I’m working on Planetfall 2: Children of Fall. The action picks up twelve years after the events in All Fall Down. Kate Leland is now a Fleet Admiral. The war that Daoud started is still going. And… that’s as much as you’re getting. I’m about halfway through the first draft now, and hope to have that completed in August. I am also editing another book for Tara Basi (Masterminders, Blocks), and may have some more editing work upcoming for a scifi novel. On top of that, we’re also moving house soon and having a baby! A strong solar flare is barreling toward Earth at 2.5 million miles per hour, but scientists say its worst effects will likely bypass the planet when it expectedly arrives by the weekend. Solar flares from the sun occur with frequency and, when unleashed toward Earth, can cause so-called solar storms. This particular one is categorized as a low-level X-class flare, the most severe of the three classes. a rant on today’s blog. In early September I am publishing a short story in my Planetfall scifi trilogy. I’ve made it available on Amazon, Lulu, iTunes, Kobo and some other platforms. Primarily, it is published via Amazon KDP and Lulu, and Lulu distributes to the other platforms. Because it’s a short story, I have priced it very low. Let’s deal with why I’ve priced it first. My writing is not a hobby. It is a second job. I put a lot of effort and time into it, and I run at a loss on it: cover art costs money, ordering paperbook proofs for physical distribution costs money, I miss out on time with friends and loved ones, and people access and enjoy what I create. I think it’s OK to be paid for that. Now, pricing. It’s a short story, just under 10,000 words, so I want it to be affordable. After some research on what short stories are selling for, I decided on a pricing point of 77p (about US99c). This matches the price of other short stories on Amazon Kindle, and is below the 99p that Shortfire Press charges (note: I agree with their pricing policy, but I am competing with the market conditions on Amazon). So far, so so sensible. A work in an established science fiction series, it’s price matches the market, and the royalty I make is about 24p. A tiny amount, but at least it’s something for the 3.5months of development time. On Lulu I priced it the same: 77p. And I ticked the options to distribute to iTunes, Kobo and the other markets to which Lulu gives you access. Unfortunately, due to licensing agreements, Lulu drops the price on other platforms. So a 77p list price on Lulu drops to 49p elsewhere. OK, so what? Here’s the rub. Amazon demands that books sold through its platform can’t be priced higher than the same book available through other platforms. Their solution is to give you a few days to re-adjust the price, otherwise they block your book. Lulu’s licensing agreements means that its distribution to other platforms goes at two pricing points: 49p, then 99p. There’s no in-between. This means (sigh) I have to make a decision: raise the price on Amazon above the point set by the market, or just have Amazon the cheapest. It doesn’t seem fair to readers on other platforms to keep the Kindle version as the cheapest. And I also know that being relatively undiscovered and pricing myself above the rest of the (Kindle) market could backfire and result in fewer sales: Kindle is still where I sell most of my books. I suspect I am going to have to raise the Kindle price at some point though. What I find annoying about this is that I want to get my work to readers on whichever platform they’re using, and to ensure that the pricing is fair and consistent and fits into the prices the market has settled on. But I am falling foul of the distribution platforms putting in rules that force me to either lose readers or favour one set over another. Well, that’s today’s rant. I’d be interested if other self-published authors have come across the same issue. In the next couple of weeks I’ll be publishing new material in my Planetfall trilogy. This is the first extension to Book 1: All Fall Down since it was published in early 2013. The teaser story isn’t Book 2 in the trilogy. That will come out towards the end of 2015 (or at least that’s the intention). The teaser is an integral part of the story, however. It is a small slice out of the normal realm of the Planetfall world you know from Book 1, and it introduces key characters into the Planetfall universe. Importantly it builds on the emotional themes of Book 1 – desperation, standing on the edge of world changing events, anxiety – and brings more texture and depth. 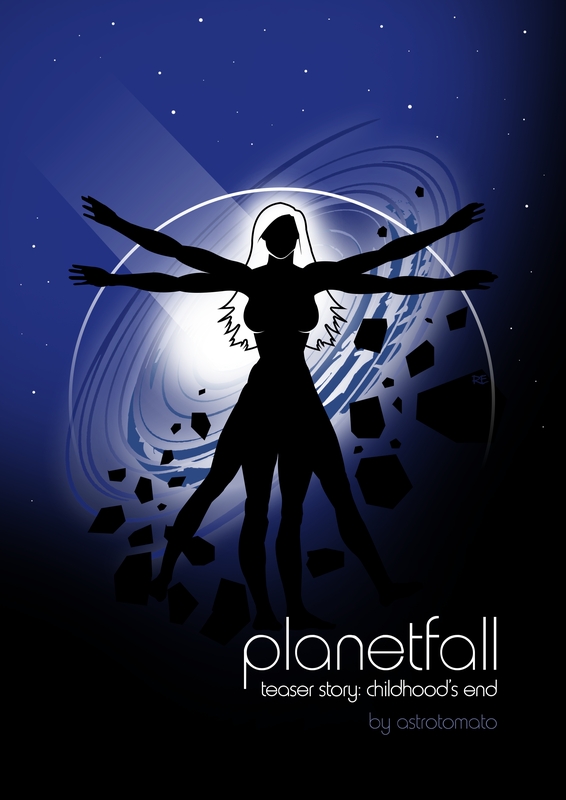 To ensure the teaser fits into the rest of the Planetall trilogy, it will come with its own book cover art work. I’m building up to publication via the trilogy’s Facebook page. All the posts are connected to the story somehow, either by selecting imagery, technical issues for the scifi geeks, or emotional themes. Please ‘Like’ it to get exclusive news – I’ll be unveiling the cover art on there when it’s ready. I hope your writing and reading is going well. Remember you can find me on Twitter @astrotomato, it would be great to hear from you. My writing group is looking for new members to join. Are you interested? We are a serious writing group, and between us we have finished at least 2 novels each, self published works, have had plays produced or come 2nd place in national novel competitions. may be willing to host a meeting once every few months (we circulate between members). My author profile is on Amazon here: http://www.amazon.co.uk/-/e/B00AX49ZUE I am principally a novelist, and am currently working on a political comedy. I have a few short film or TV pilot scripts under my belt, as well as a collection of short stories, and am an alumnus of City University. Tara Basi is a Birkbeck writers alumnus and a novelist and playwright. He writes dystopian fiction and satirical plays/radio plays. He is self-publishing his first novel this year. Max Novaz is also an alumnus of Birkbeck, and is principally a playwright of farces, with his first production recently performed in Bedford. Max is currently working on a novel, and editing a play set in a Spanish holiday resort. We are open to fellow writers of all levels of experience. A fondness for Rioja would be advantageous!